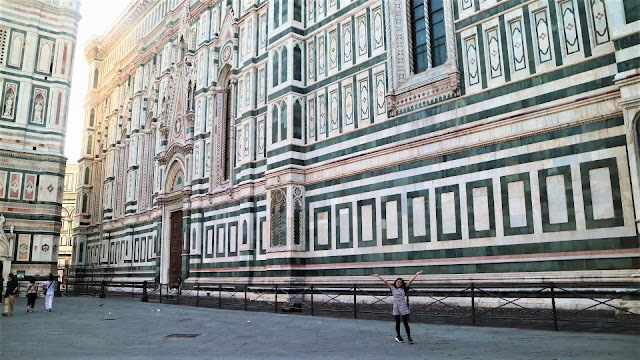 The trip to Florence came to me and my daughters by surprise but it was wonderful nonetheless. It was part of our Tuscan experience early last year of 2017 and like many tourists, I was blown away by its majestic beauty, and now I have this deep yearning to go back and immerse in it some more. 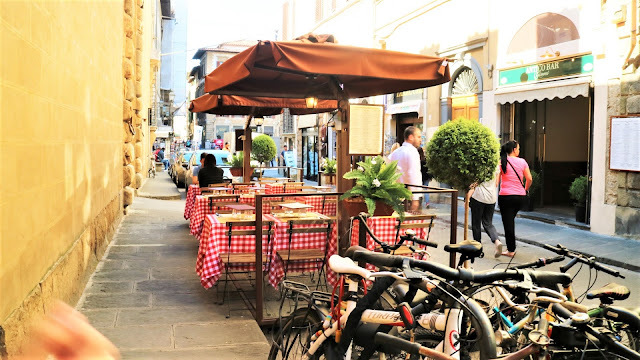 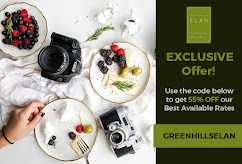 Perhaps, it was one trip to Italy that one should have even for a day or two and you don't really need to spend that much going around the city and walking is the best way to really see the hidden gems of the city, it's nooks and cranny that teem with arts and culture in tenfolds even. 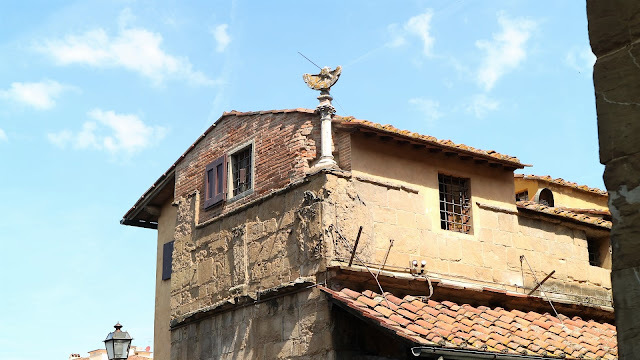 Coming from Milan, it's just a four-hour drive, but my brother-in-law brought us first to Pisa which is about 3 hours and 30 minutes and from Pisa is around 2 hours to get to Florence. 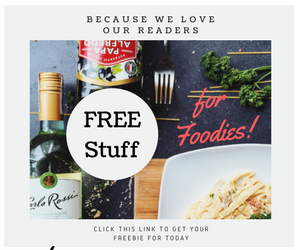 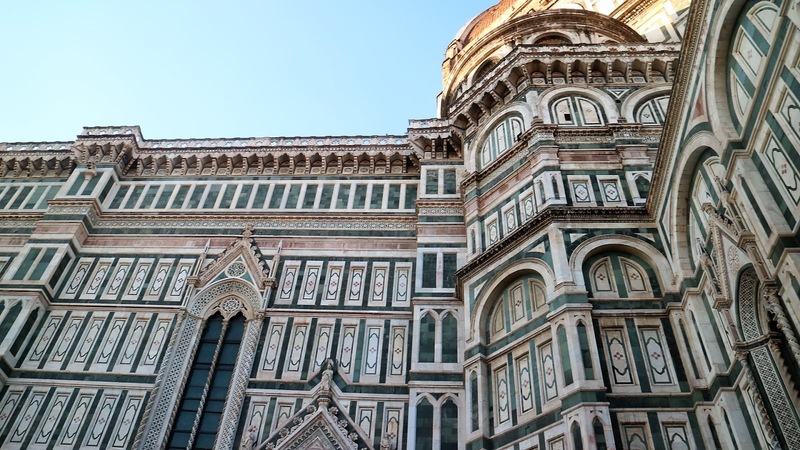 Armed with lots of snacks and deli and juices in their car, we drove off to northern Tuscany and enjoyed the scenic landmarks in the said cities and we ended our tour down Rome and back to Milan in 5 days. 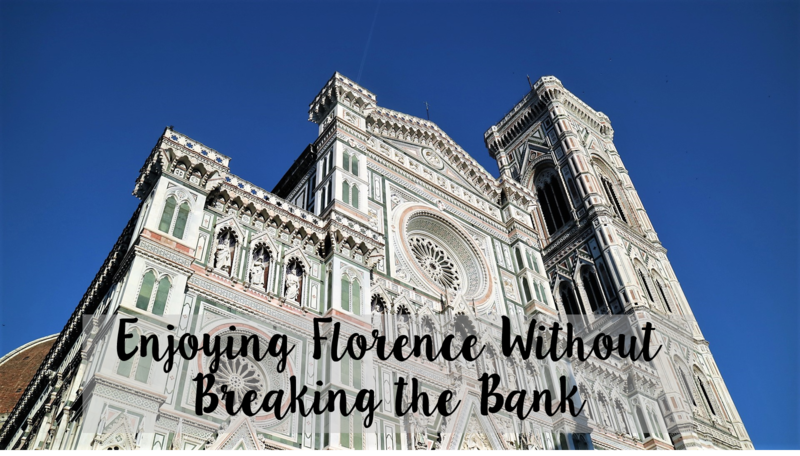 You might say it may be an extravagant diversion, but it's actually doable and you don't actually need to spend lots of euros. That being said, you can actually get contented with the surrounding and the facade of the major landmarks and you can just put off the copious expense of purchasing entrance tickets to these tourist trap churches and museums. Inside the Bigallo, you can see beautiful frescoes depicting orphans being adopted by foster families in a very touching Florentine scene. 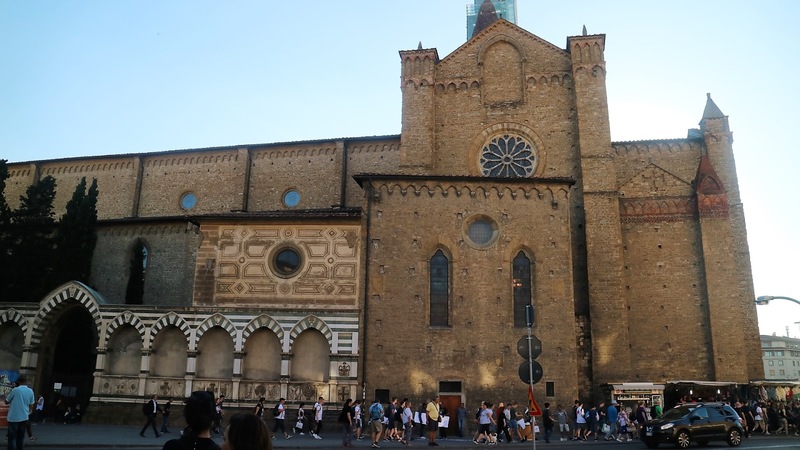 This also gives you insight on what people looked like back then, Alexandra pointed out the complicated braids and hairdos of some of the women which clearly meant they were nobles. 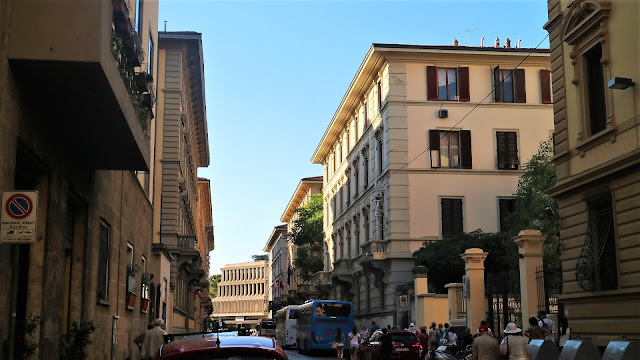 Walking in and about the squares you'll get to see Piazza della Repubblica. 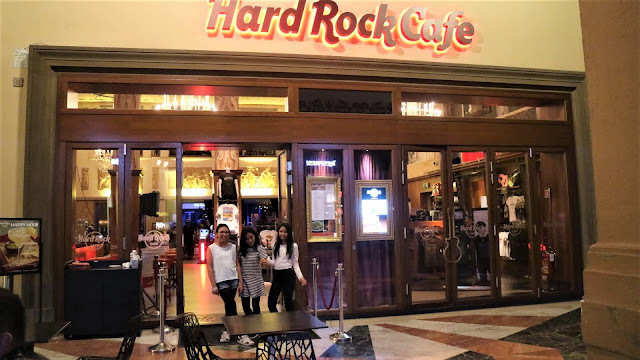 We actually just chanced upon it as we got lost looking for Hardrock Cafe. 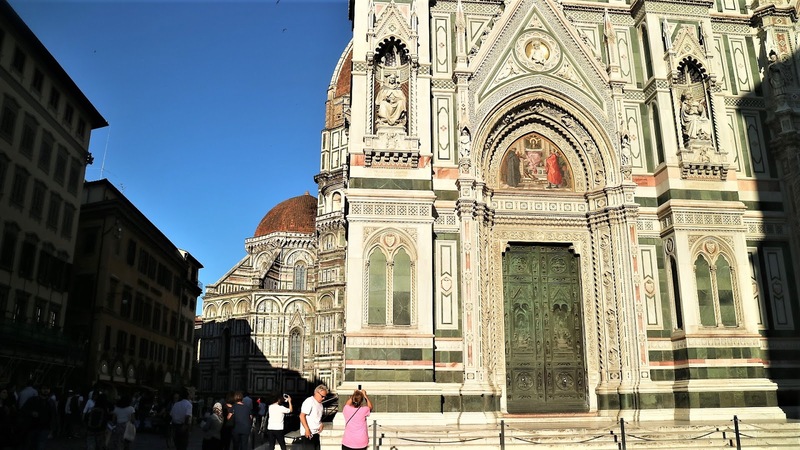 When thinking of Florence, one particular Renaissance church instantly comes to mind: Santa Maria del Fiore and its famous dome, more commonly known as the Duomo. 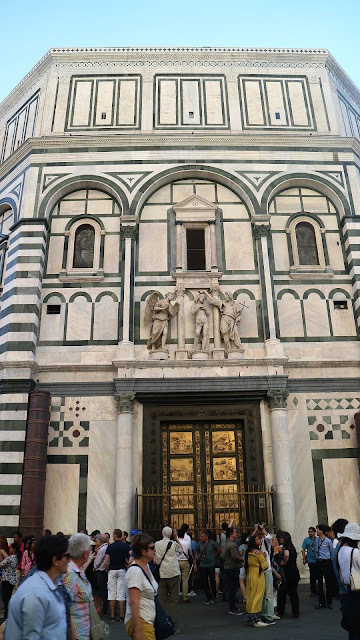 Many would attest that when you think about the Baptistery of St. John in Florence it's easy to remember Dante's words in the Divine Comedy describing it as "my beautiful San Giovanni". 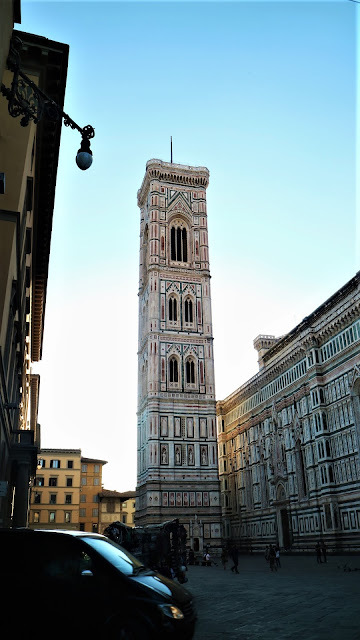 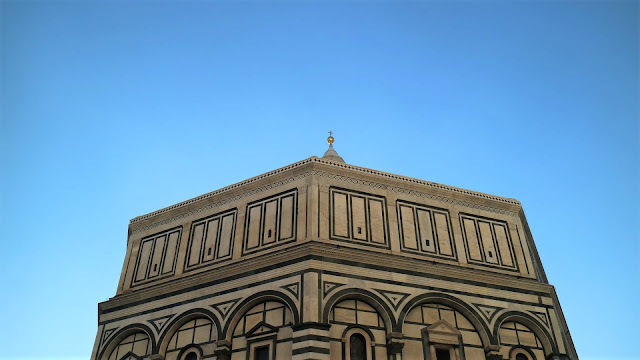 Located in Piazza del Duomo, right in front of the Cathedral of Santa Maria del Fiore, it has been indeed one of the most important landmarks in Florence. 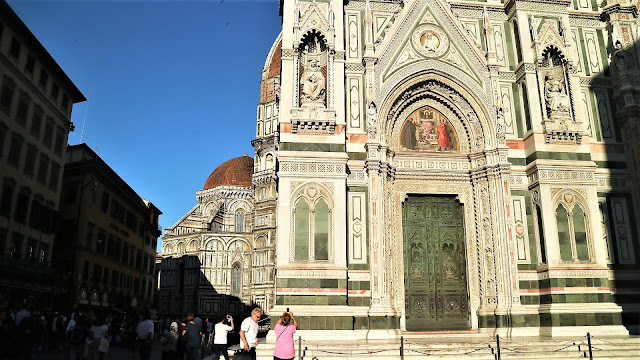 It is depicted as "The Gates of Paradise," which had received their name by Michelangelo who is believed to have exclaimed: "they are so beautiful that they would be perfect for the gates of paradise". The doors consist of 10 rectangular panels, displayed in two lines. They depict scenes of the Old Testament from left to right and from top to bottom. 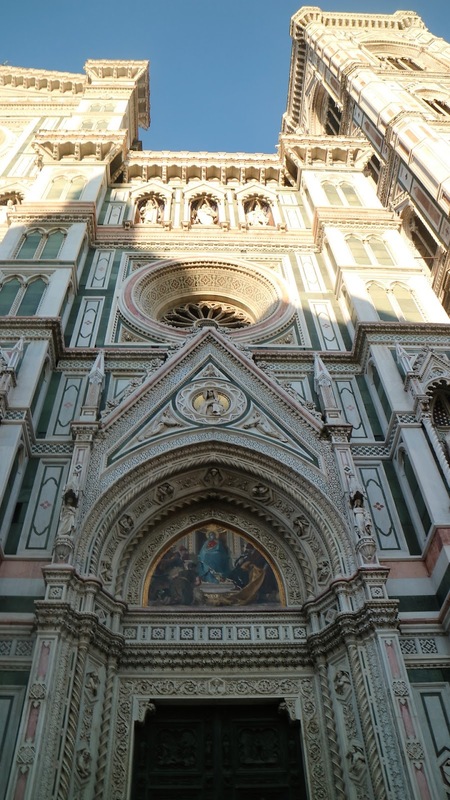 In each panel, Ghiberti described more than one scene so that there are over fifty scenes depicted. 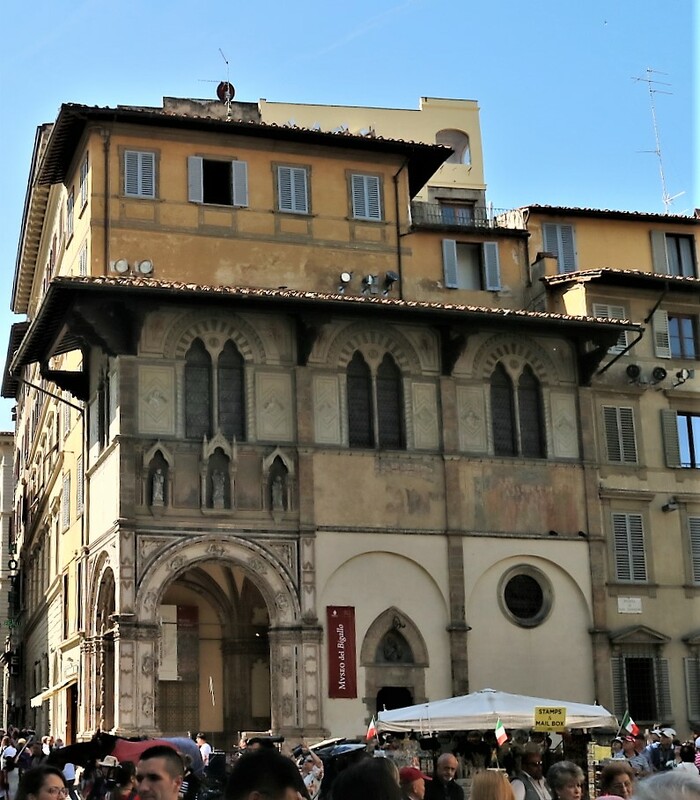 All around the frame of the doors, Ghiberti added 24 small bronze busts of famous Florentines, including his own self-portrait. It is dedicated to Florence's patron saint, has an octagonal plan and an octagonal lantern with a cupola. 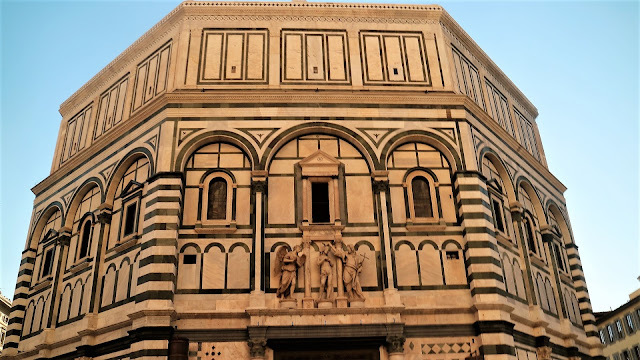 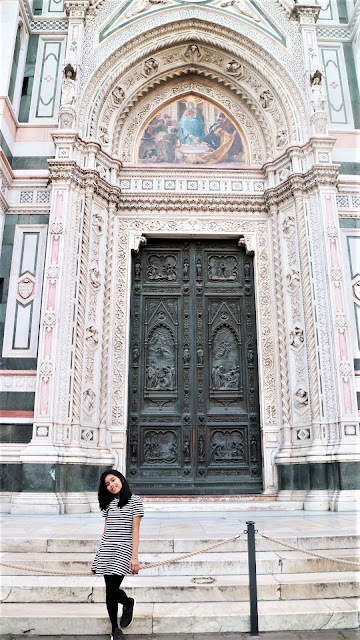 Outside it is clad in geometrically patterned colored marble, white Carrara marble and green Prato marble that is typical of Florentine Romanesque architecture. 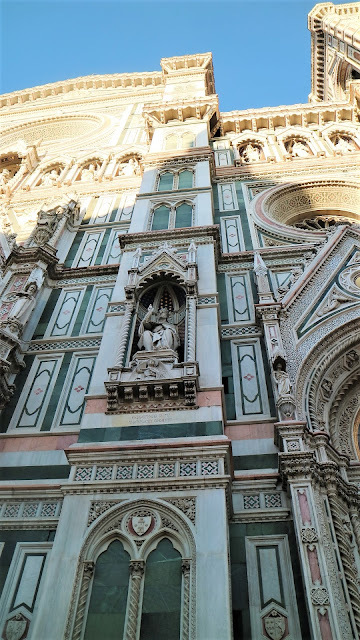 Notice the green, pink and white marbles on the walls of the Duomo? It had defined the iconic Italian renaissance era design which later on had been adopted in the Florentines' houses. The buildings in Florence still hold the marks of being the brick-and-mortar of the city. 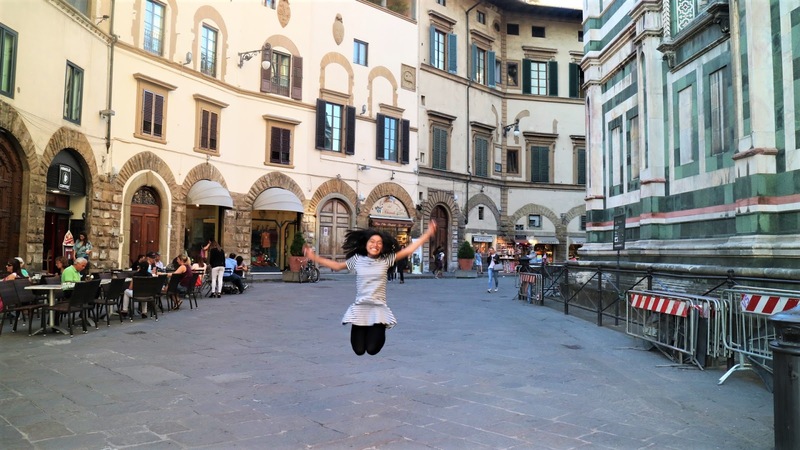 The Ponte Vecchio bridge is the oldest and shortest of the six bridges of the city. 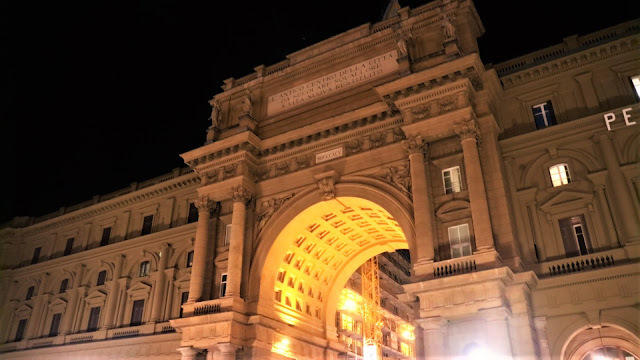 It is also the main bridge as it leads people to the heart of the city, connecting the Pitti Palace to Piazza Repubblica and Piazza Duomo. 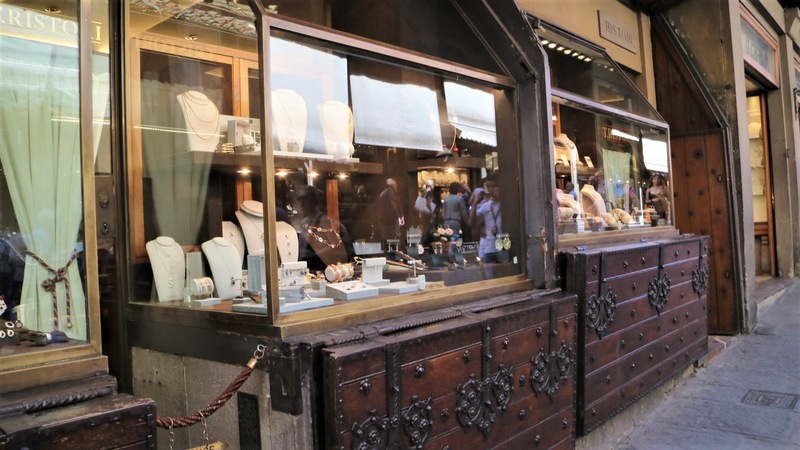 Although it is fun to walk over the Ponte Vecchio and see all the sparkly, shiny jewelry in the shop windows, it is even better to take in the views of the bridge from along the riverside or up on the hillsides by Michelangelo square. 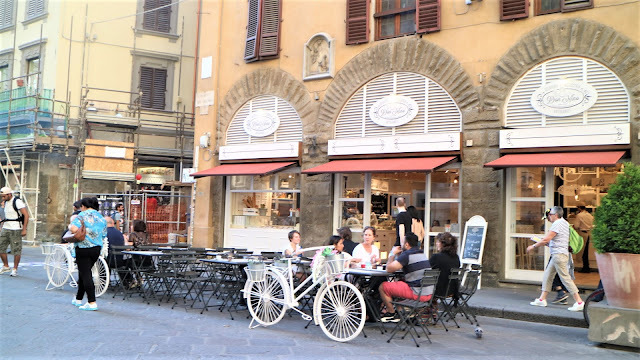 The middle of the bridge is really nice for people watching or hearing some live music in the evenings.